The everyday chore of the country people of the West of Ireland during the early days of World War Two was cutting down on burning all the timber they could lay hands on. This was not just to cast aside. Oh no! this was done for a special purpose. To create as much gas as possible. For this gas was to be most essential for our economy – to be used to power our lorries, buses, and even trains, for the unforeseen future. This was Ireland’s answer to the worldwide oil rationing! And so every able bodied man and family played their part in this all important work – to keep our important services moving. 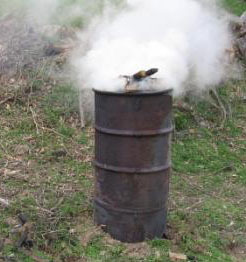 The method used to obtain this gas was by burning the timber in a large barrel – a firebeing started at the bottom of the barrel in the morning and continued right through the day. By evening the barrel now full to the brim with cinders – burnt timber. They were still very hot as they were burning all day. On top of this hot barrel of cinders was placed a covering of fresh scraws of earth and grass. This was pressed down to make it airtight. I’ll never forget the smell of GAS emanating from the barrel top. This was CHARCOAL at its best. All loaded barrels were collected weekly by lorry, and that was the PAYDAY for the farmer, who had worked so hard all week. This industry created a lot of employment locally, in those difficult times when jobs were hard to come by. I really enjoyed helping in the making of a little bit of history here in neutral Ireland when most of Europe was embroiled in War. This page was added on 12/01/2011.